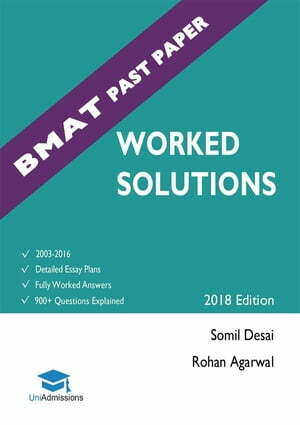 Collins Booksellers - BMAT Past Paper Worked Solutions by Rohan Agarwal & Somil Desai, 9781999857073. Buy this book online. Whilst doing past papers is great practice- it’s important that you understand how to tackle each question quickly + accurately. Published by the UKs Leading University Admissions Company, this is the only book devoted to helping you solve past BMAT questions. Written for the 2018 Entry, it contains detailed explanations for every question from 2003 – 2016 as well as comprehensive essay plans for section 3. These solutions contain valuable insight on how to approach difficult questions and also walk you through the most efficient methods for rapidly getting the correct answer. Filled with examples of time saving techniques and score boosting strategies, this is a MUST-BUY for anyone using past papers as part of their BMAT preparation.